Announced recently at Nokia World Abu Dhabi, the new Nokia Lumia 1520 features plenty of features that is new to the Windows Phone 8 ecosystem. Among them are full HD 6-inch display and Qualcomm Snapdragon 800 processor as well as being among the first device to receive the Lumia Black update. When it was unveiled at Abu Dhabi, Malaysia’s name was not part of the initial release market and to be frank, I personally was rather doubtful about its release in our market (at least anytime soon). However, it seems like my doubts are rather unfounded as this teaser by Nokia Malaysia might proved otherwise. 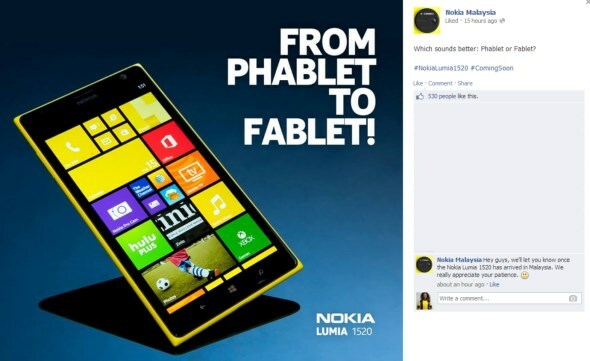 The reason is rather simple: Nokia Malaysia’s Facebook page generally doesn’t highlight a device unless it is coming to the market. Nevertheless, you know how things work around here – it is only official once there is an announcement by Nokia Malaysia. Meanwhile, do check out our hands-on first look at the new Nokia Lumia 1520 right over here to learn what the device is all about.